Munoz : I don’t know, Phil, you keep looking at those. Phil : Hey that’s Cabell. That’s the fastest I’ve ever seen anyone go on a surfboard. That thing was unreal. It looked like it was shifting gears or something. I had a picture of a big wave with Pat Curren on it – there it is. Besides that shot of Greg Noll at outside Banzai, I think this is the largest wave ever ridden. Pezman : What about Makaha back in ’59? Wasn’t there some 35 foot happening back then with Downing and those guys? Phil : Oh, yeah, Downing came up bleeding from the ears and spitting blood. He got driven so deep; I wasn’t there, but Bill Drako was there. He came up bleeding from the ears, and you know all those guys can all dive 50 feet. Munoz : Well, Buzzy’s hit bottom in 65 feet of water there. Phil : And to that add whatever the wave was above that figure for the full round trip (chuckle). Like if it was 20 or 30 foot wave and it drives you down 70 feet, you’re going a hundred feet straight down, just like that. Phil : We’ve just got to ride a bigger wave. A wave that’s cresting right on top of the peak of the mast. Phil : Just to do it. You’re better off in a boat than you are on a surfboard, especially with those new shortboards. Pezman : The boats faster? Phil : Oh, gee, you have so much more authority with a boat. We were pushing over the backs; we had a better wind on that small day that we went out. We could go right up over the back and catch the wave. Munoz : We could just pass the wave out. Phil : You could let a wave go by you and then just catch up to it, start to catch it from behind. Pezman : So the danger would be if you lost your speed after you’d gone down the face? Phil : Well, no, this day was more of an offshore, so we were completely helpless at certain times during the takeoffs. There’s one interesting thing that we did that we’ve never talked about. Like when you first start out to do something like this, you’ve got all these grandiose plans on how you’re going to do all this elaborate stuff, but when you get out there, mother nature just doesn’t put up with it. When it came right down to it, we couldn’t even put the jib up. You know, because you can’t pull all those lines and hang onto the boat. You just can’t run it; you get lost in the logistics of the whole thing. I mean just getting it through the shorebreak is a big, uptight, major deal, and then just getting the thing out in one piece. Pezman : It really sounds like a stunt, rather than an everyday thing. Phil : So usually one guy steers and sheets because like it’s a coordinated thing. But Mickey and I, we’ve been sailing together a lot, and so we get out there and it’s just rougher than hell, and we’re kind of uptight. I don’t even want to hold the sheet because I want to hold the boat. We’re just bounding all over. So Mickey sheets and I’m steering. It’s like trying to drive a car in rush hour with somebody else working the pedals, only we’ve sailed together enough where we’ve gotten used to it, and it’s very comfortable. But, guy, you go over a wave and it’s just a big gust lifting the whole boat out of the water, and you don’t know if the other guy senses it. Whereas, if you’re steering, you feel like you’re sensing more of it. (Girl interjects) Phil said Mickey was yelling left and right; and Phil was yelling in and out. Phil : The guy that’s working the sail is worrying about the steering, and the guy that’s working the rudder is worrying about working sail. Munoz : That’s right; that’s right. Phil : We’ve never talked about that. Phil : It was great. Munoz : That’s right, exactly. Never thought of it quite like that. Very good, very good. Phil : Even though we have sailed together a lot, you still don’t have a perfect feel for it, because the other guy is very suggestible. Like I go pretty much where he told me to steer, and he’d he’d do pretty much with sail what I said to do, because I don’t really think you realize what the other guy is doing, first of all. I mean, we do better than anybody else. Munoz : I thought it went very smoothly myself. As far as the whole deal wen, I thought we rode and did everything we could under those conditions. It was a matter of luck, of being positioned. It was big enough that it would sometimes be breraking on the point and sometimes over at the bowl and sometimes in the channel. It was just a matter of luck being in the proper lineup, because all the surfing lineups were different than they would be for us. We’re so far out in the ocean that we can’t use the regular surfing lineups. So we had to charge around, back and forth; a couple times we found ourselves really far over on the point. Pezman : Don’t you think the surf was coming up while you were doing all of that? Pezman : What were the waves like? Phil : Just a little bit too blown out for surfing. Pezman : How big did they look to you out there? Phil : You know when we came in and looked out at the waves, outside Banzai was going down. Did that happen while we were out there or was it just coming up while we were doing it? Munoz : It was just coming up. Phil : Because I don’t think outside Banzai was coming down while we were out there. That would’ve really scared me, if I had seen it go down. When outside Banzai starts coming down, it’s time to get out of there. Munoz : It was pretty good size out there, and it was getting a lot cleaner too; the bump was moving out of it. Pezman : What were you looking for in the waves; what kind of waves did you need? Phil : My vision was just size, but then we went out on a real small day before the second time just to see how the boat felt and get used to it; and we got so excited with it just riding the waves that I can’t help but think that surfing a boat all the way to Hawaii in those big ocean swells would be the same kick. I mean it was really fun. Munoz : It was fantastic. You know we had so much control in smaller waves that suddenly the big waves seemed very possible. Pezman : How did the added element of the wind affect the surfing nature of the thing? Munoz : Wind? It adds to the control. Phil : That’s a good question. Like a guy that’s never ridden a boat before, but had surfed a lot, wouldn’t dig the outside power. They’d like the sole source of power to be the wave, but it isn’t offensive. It’s groovy. It’s just another wave you’re riding. It’s like you’ve got two waves that you’re playing against each other. 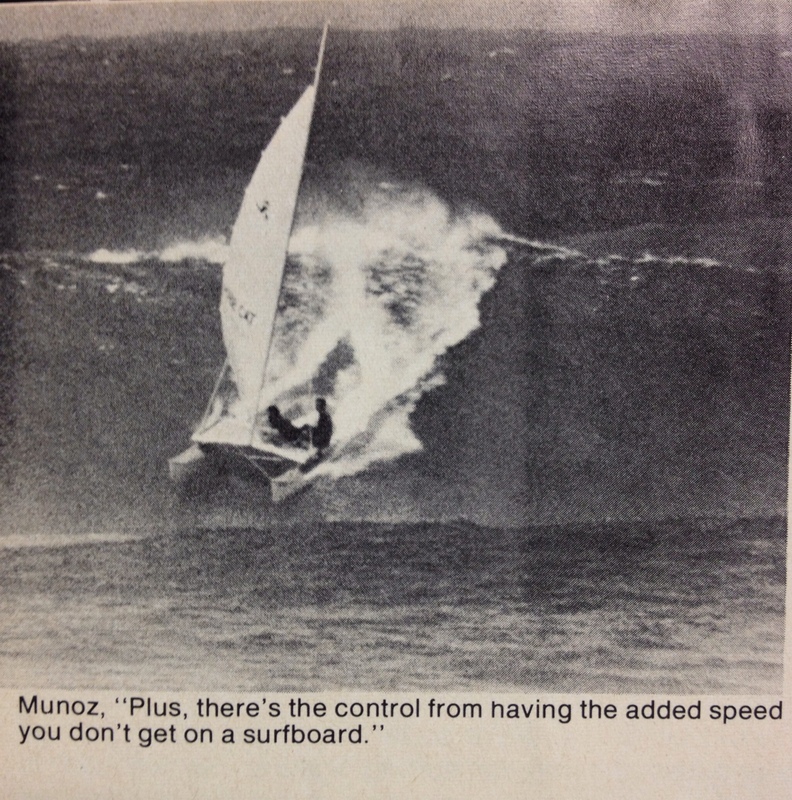 Munoz : Plus, there’s the control from having the added speed you don’t get on a surfboard. The ability to cross a big flat area and get into another peak. It would’ve been interesting, you know, if we’d had more time to get into doing this. We might get further and further over and pretty soon be getting into some really radical positions, super radical. Like coming across from the point and making that bowl would be an incredible thing on a good sized wave. Pezman : Like riding Sunset for the first time on a Hobie Cat was probably comparable to riding Sunset for the first time on a surfboard. Munoz : Right, right. Although we did catch waves outside that were certainly as radical as the inside waves. We caught waves way outside in the ocean where probably not too many guys have taken off on surfboards. Pezman : How much further out were you than surfers normally ride? Phil : You know those big ones that cap out in the channel on a big day? They back off and screw around and shift. Well, we were playing around out there and they didn’t even film it because we were so far out, but it was really a lot of fun. All we could talk about that evening was sailing to Hawaii with a big storm coming up and just surfing for like 24 hours like that, night and day. It would be really exciting in the middle of the night to be in 20-foot surf. Munoz : Like our boat speed was probably awfully fast in some of those waves. Phil : Oh, yeah, because those waves are not in shallow water. They’re going like hell. Those were fast moving waves. They were capping, I keep thinking about that Hawaii deal. Ocean swells are supposed to be moving at about 22mph. Phil : I was out one day at Lanikai and there were 30 foot swells in the ocean, and I later found out that Waimea Bay broke that day at about 25 plus. And so the same waves that are breaking at like Sunset and Waimea are out in the ocean and, in fact, probably bigger and moving faster. They wouldn’t break top to bottom, but they would be so thick that a surfer could never ride the, but if we ever got in that kind of conditions, we could ride one wave for 24 hours maybe. Munoz : The waves work in a deal where the last wave in the train in mid-ocean, now, moves faster than the front waves, and ends up becoming a front wave, while the front waves are kind of diminishing. Phil : I didn’t know that. Munoz : That’s what Ricky (Grigg) told me anyway. Phil : Rochlen has a fabulous story. Have you ever heard Rochlen’s story? 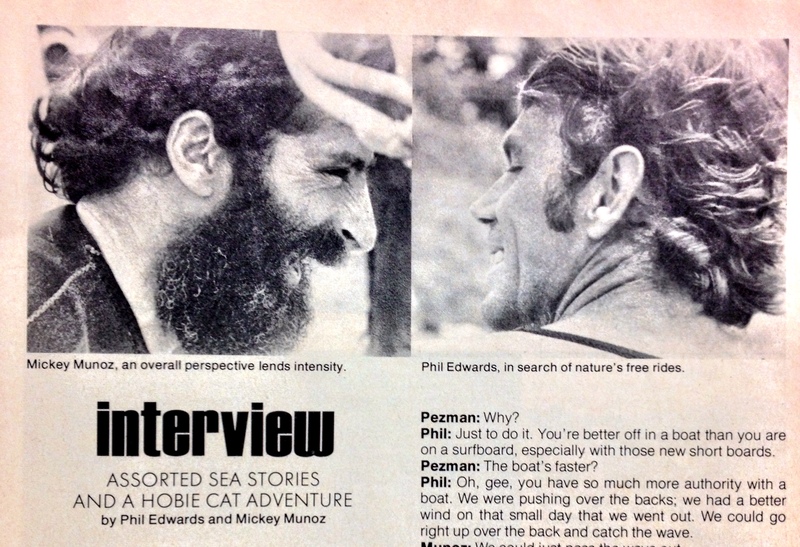 About the first time he ever sailed a catamaran to Hawaii. He takes about two hours to tell it, and he’s pretty prolific, you know, the way he’s… he’s good at it. He’s told this story a lot of time. 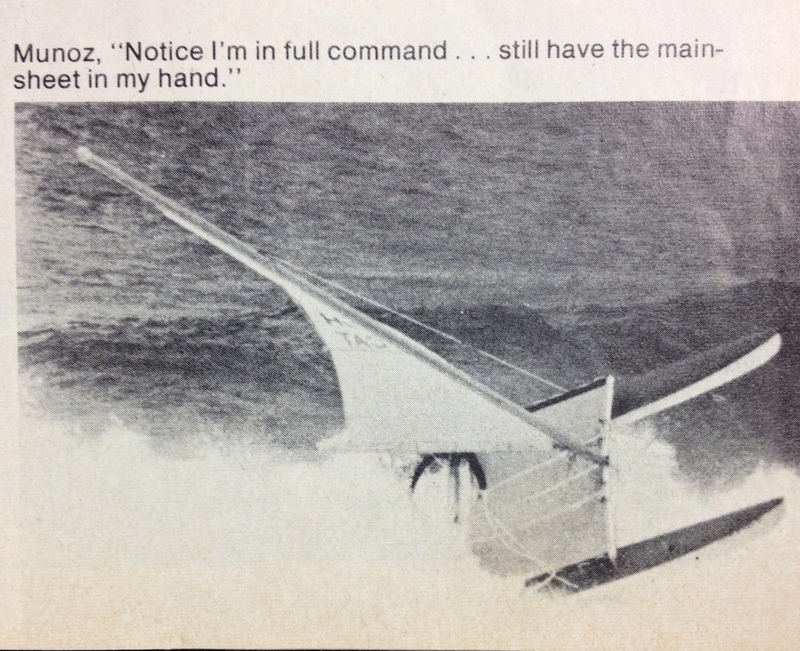 But anyway, like the first catamaran they ever built somewhere around 1948 or so, was so successful, they built another one immediately to come up here and sail down with transpac, and it happened to be a real windy year. Everytime there’s a big swell in Hawaii, those swells have traveled clear across the ocean at that size. Like if you see a 30 foot wave in the Islands, that wave’s been alive for three or four days getting there, right? And it’s been 30 feet the whole way. Munoz : Yeah, well, maybe bigger. Phil : Because I’ve seen big swells in the ocean. Like I saw bigger swells off Lanikai that day than I’ve ever seen break, except maybe Kaena Point. So, Anyway, Rochlen’s telling this story… the boat’s got this tiny little dog house and just one guy steers it. He’s standing up in the back and he kinda leans against the tiller bar. One guy’s got the whole deal, and you take these drops and you can’t take them straight because, just like a surfboard, you’d pearl straight to the bottom. And he tells about a guy standing out there with four other guys, their lives depending on how he takes the drop. You know, these are breaking waves; in fact, well; I’ve never seen a top-to-bottom breaking wave in the ocean, but Rochlen claims that they were top to bottom. (Both Munoz and Edwards laugh nervously.) Or, you know, with enough of the top furring off that it’s the same problem as breaking top to bottom. And, so Rochlen said that the roughest night they had was when he’d just gotten on the tiller at about four o’clock in the morning,; the other guy had burned out. Rich Muirhead, he’s dead now, he was really a good sailor; anyway he handled it all night long, and finally about four in the morning, he crashed. And so Rochlen is on the helm and they’re just going by feel, and everytime the stern started sucking up in the air, they just put the thing over and started angling so they wouldn’t pearl. And all night long, everytime the stern comes up, he’s just shoving it down, and all of a sudden dawn breaks about 5:30 or 5, whatever it is, and you can start to see, and he said he could see that the whole swell was starting to line up in front of him and bowl. Phil : And he said he actually had to make a decision during that morning of whether to try and straighten out and run with it, or pull over the top. I mean, he was talking just like a guy would talk after riding a big day on the North Shore. Munoz : Well, you know, I’ve seen it like that. Phil : So Mickey and I sailing on those outside waves, probably got a little taste of what sailing a little catamaran out in the open ocean would be like. Because like I remember we stayed up long hours at night talking about sailing Mickey’s boat over to Hawaii after that, but I can see from a surfer’s standpoint that the best looking wave is the shorebreak. You know, like that stuff outside, even if we had pictures of it, wouldn’t be impressive, but it’s really thrilling if you’re there. Phil : Munoz bailed on Carter Pyle and I about ten years ago, and we never let him forget it. Phil : You had no choice. Mickey had the death seat. He couldn’t bail. I told him that as we were going out, just when we hit the water, I said, Mickey you’re in the death seat. I had it all figured out for months before we went out, I laid it on him. Munoz : I couldn’t believe you told me that, ’cause there’s only one way to bail, and that’s off the back; and that means I have to go over Phil. Phil : He’d have to climb over me, and he isn’t above doing that. Munoz : Well, you know we talked about how we were gonna bail out and everything. (Looking at the photos) Notice I’m fully in command of the situation; I still have the main sheet in my hand. But I dove off the back too when we got in the shorebreak, and the boat just kind of settled upon the sand. I did sort of scurry off the back end on that one. Phil : Hey, this was a funny deal. You know like when we went to do this thing, they went, “Oh, yes, you’ve got two boats over here waiting for you;” and I keep telling them, hey, we’re gonna lose the boats; just forget the boats. And they’ve already got a guy that’s handled the boat, you know, it’s his boat now. You know, he’s got that super racing stuff all over it; it’s all fixed up. It was really an uptight deal to take the guy’s boat out at Sunset Beach. Really it was supposed to be our boat, but the guy had done a whole bunch of work on it. Munoz : Yeah, it was very nice. Pezman : Would they have given him another boat? Phil : Yeah, but, he’d done a lot of work himself. He had carpeting on the sidebars for non-slip surface, stuff like that. Munoz : It was nicely done. The boat was really well rigged. Phil : It was rough out there. Everything is so much more violent out there. Munoz : The boat was pitching, plowing, and yawing from side to side. Phil : Everything is so much more violent out there. Pezman : Because you’ve got so much more surface in the wave, more surface to control? Munoz : You’ve got so much more power out there. Phil : Sometimes it’s scarier just handling the wind than it was the waves. Munoz : It was probably blowing stronger than an average trade. Probably around 25 knots. Pezman : Did the boat seem like it was a good surfing boat? Munoz : I can’t think of any other boat I’d rather do it in, personally. Pezman : Hey, what other spots do you think you could ride? Phil : Well, Flippy (Hoffman) touted… have you ever been around Flippy very much? Well nothing’s ever right. He’s always got a topper; there’s always a better way of doing it. He’s saying the whole time, you’re shooting from the wrong spot; you’re riding the wrong wave; the sun’s wrong and everything was wrong. So, I said, okay Flippy, what do you want us to do? So he puts us in a car and drives us down to Avalanche, and God, you think it was hard to line up at Sunset; how would you like to try and line up at Avalanche? Munoz : Yeah, well, maybe. Pezman : What about breaks in Waikiki, the big summer breaks? Phil : I’ve ridden Rice Bowl on a pretty big day, an 8 foot day. I saw a guy catch a 12 foot wave at Rice Bowl. Munoz : See, on the South Shore they ride pretty big 10-12 foot waves. Munoz : Hey, now Rice Bowl’s a pretty juicy wave. Phil : Yeah, Rice Bowl. It’s pretty respectable; it lets down kinda hard. Like Ala Moana let’s down, but it’s still a very slow wave compared to Sunset. I mean like it might curl fast, but the wave rolling toward the shore speed is like half the speed of Sunset. Pezman : It’s shallower further out? Munoz : Yeah, it’s more like the coast, more like it is here. I think we could ride any of the outside breaks. Phil : The thing is, anything more than what we were out in that day, I can’t swim in. Like outside Banzai would be groovy, but who the hell wants to swim in? Munoz : We couldn’t go left; we’d have to go right. Phil : Next time we’re gonna get out own photographer and airbrush in the crest ten feet higher. I had a dream of the crest over the mast. Munoz : The only place might be point surf at Makaha, which would be very tricky. Oh man, you’d get a big wave there that’s as big a slopping thing of water that you could ride. Pezman : You could catch it way outside and be to the bottom of the bowl by the time it bowled, and by then you’d be through it. Munoz : That would be a hell of a spot, plus you’d have Buffalo right there with his boat. Phil : Yeah, I hear Buffalo wants to get a Hobie Cat. That would be great, huh? Hey, he’ll try anything. Munoz : Yeah, you could go out and ride Klausmeyers. You could ride a lot of spots out there. Hey, listen, there;s gonna be guys riding waves all over. I talked to two guys on the South Shore that are in Hobie cats just wailing, and they’ve got their boats just really super tuned and rigged. Pezman : How do the remote control gliders that you fly fit into the total picture of what you like to do? 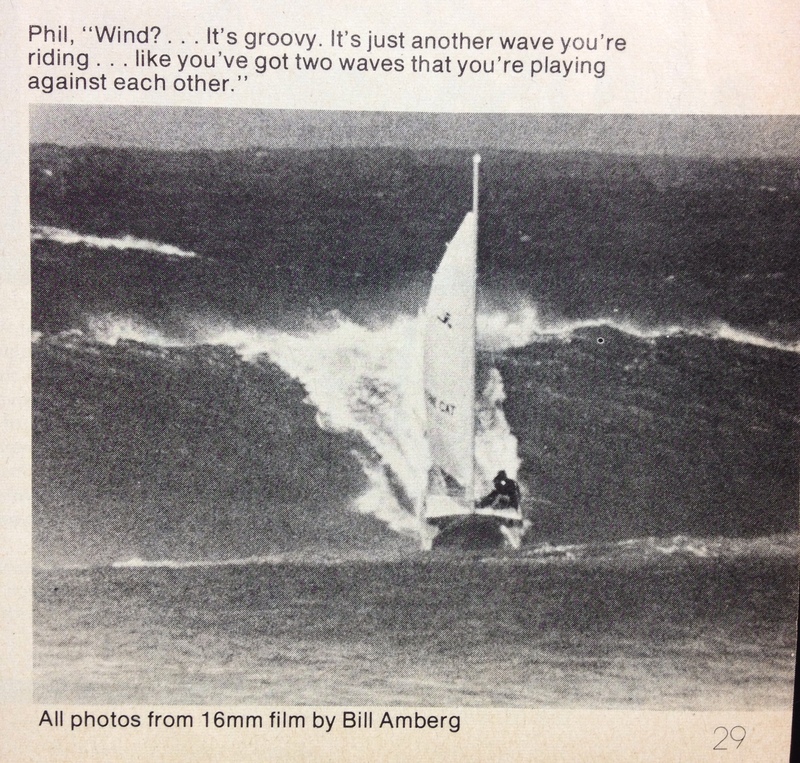 Phil : Well, it’s all the same, the surfing and the sailing, and the gliding. They’re all nature’s free ride. Pezman : How about skiing? Phil : Not skiing because the hill isn’t moving. Like soaring, the similarity with surfing is amazing. The terminologies are the same; they have waves; waves soaring is a big deal. They go up to fantastic altitudes wave soaring. Waves are set up by mountain ridges. I think they’ve gone up to about 43,000 feet. The guy couldn’t go any higher, ’cause they need a pressure suit after that -a full on space suit. They’d have to have lubrication in the joints so they wouldn’t freeze; they’d have to have oxygen. And guys have gotten into big waves up there. These waves have tremendous velocities. They’re just rising air. Instead of the curl, they call it the rotor; and if they get on the back of this rotor; it’s a super down-wash. But the thing I have against skiing, I’m not a skier, as far as including it in Nature’s free riding group, is that it doesn’t have the same thing as surfing, sailing , and soaring do. There’s a stationary object involved, whereas the other ones all have two things moving. I don’t know because I’m not a skier, but I know that in surfing, both the vehicle and the propellant are moving. Sailing’s the same, and soaring is more like that than the other two. Soaring is entirely based upon the driving force moving. When you have a wave or moving air in soaring, or a thermal in soaring, then you have moving air that’s rising faster than the glider is falling, and you can gain ground. Like I’ve been out on a day when you can release from your tow at 3,000 feet, and in a short length of time, you’ll reach 12,000 feet. Like if skiing offered a ride back to the top of the hill, I’d dig that. That was one thing I always liked about Makaha. You know the argument is that you have to paddle back out surfing, you have to pay for that ride. That’s what used to be so neat about Makaha, you know, the shorebreak would give you a ride back out, a free rope tow. You know the Island’s really neat. If you have the time, you can just kind of throw your board in the water and let the wind blow you out. That’s the thing about those free ride sports; if you kind of get your wits in harmony with the forces involved, you get a free ride for a short time. And to do so, you’re always placing yourself in a position where you can get swatted. You know, like surfing’s a good example. In surfing, it’s a swim to the beach, but soaring is a little more penalizing. When I was reading along while copying, I couldn’t even wrap my brain around the unbelievable pair of cojones that Mickey and Phil had. To take a boat (A BOAT!!!) surfing in waves that size…?? Wildly insane! Pioneering, yes. But, out of their heads nuts. Mickey describing that if he wanted to bail, he had to physically jump over Phil to make it off… unreal. My favorite part, though, is Phil describing ‘Nature’s free rides’, reading it was like learning to truly appreciate the art of just riding the wave. No fancy tricks, no hard turns, just flowing down the provided lines of the wave. We are so lucky to be surfers. 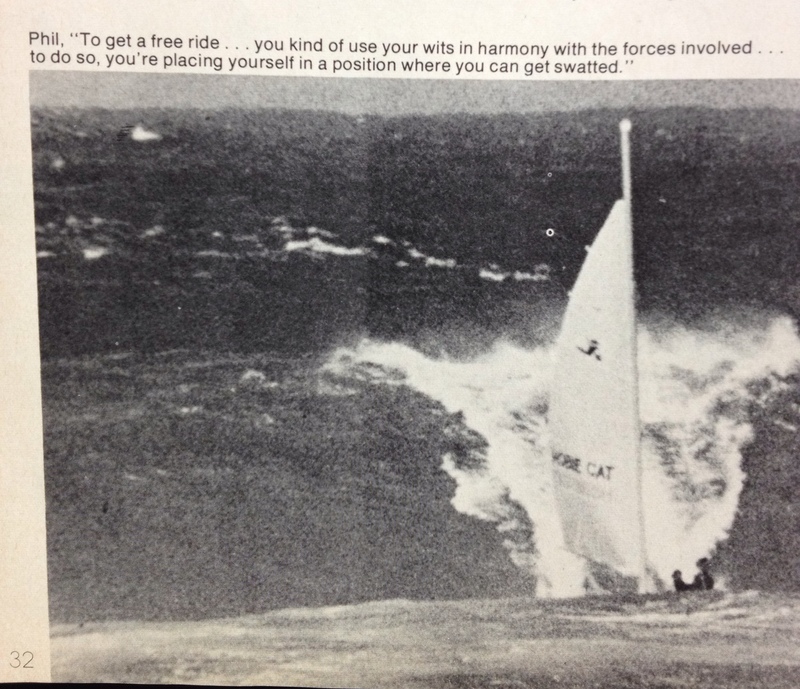 This entry was posted in Hobie History, Hobie Surf and tagged blog, bud browne, california, Dana Point, hobie, Hobie Alter, hobie cat surfing, hobie catamaran, Hobie Shop, Hobie surf, Hobie Surf Shop, Hobie Surfboards, longboard, makaha, makaha 1950, Mickey Munoz, natures free ride, no bad waves, north shore, phil edwards, rice bowls, sailing to Hawaii, science, soaring, south shore, style, sunset beach, surf, surf shop, surf shop blog, surfer magazine 1973, Surfing, surfing a boat, surfing a hobie cat, surfing sunset in a boat, surfshops, waves. Bookmark the permalink. ← Hobie Shop :: HOLIDAY HOURS!! !